Whether you’re moving across the street or across the world, the professional movers at JNR Global Logistics are ready to make your relocation seamless. Based in Honolulu, HI, this locally owned moving company proudly offers high-quality moving and relocation services for commercial and residential clients within the community. Specializing in providing relocation services for military service members and government entities, this moving company has unescorted base access at all U.S. military installations, as well as access to every seaport. You can rely on their extensive experience to make your federal or state government relocation a smooth and stress-free process. They also offer moving services for those moving to or out of Hawaii—whether to or from the mainland or somewhere else in the world, their team has the skill and expertise to handle your move from start to finish. For those with priceless family heirlooms or artwork, they provide white glove services to ensure your precious items are handled and moved properly. Committed to providing exceptional service, each employee who works for this company has undergone a minimum of 5,000 hours of prior moving experience as well as a thorough background check performed by the U.S. Department of Homeland Security. You can trust that your belongings are in good hands when you choose this team for your next move. 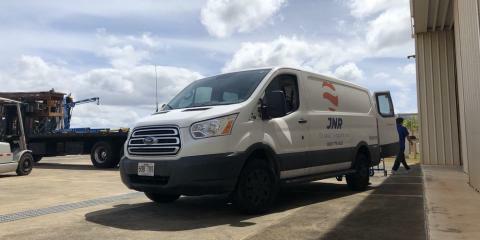 Offering fast and efficient service, there’s no better moving company for the job than JNR Global Logistics. Don’t leave the safety of your belongings in the hands of anyone else; call their office today at (808) 773-0035 to get started. For more information regarding their services, visit their website.